Good Morning! It's time for this week's Featured Spotlight Cards from last Saturday's challenge (SSS215). Thank you all for participating! First is Jeanette's sweet card. What an adorable image and fabulous coloring. The papers and embellishments are so nice. The white decorative scallop strips look lovely. Next is Eret's darling card. Such a cute image and it looks lovely in the decorative oval frame. The pink flowers and the background paper look beautiful. Finally it is Hayley's beautiful card. Such pretty flowers. The butterfly is just the perfect touch to this pretty card. 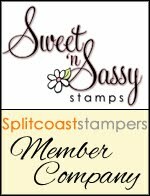 Make sure you come back tomorrow to see the new sketch and the fabulous new samples from the Sugar Babies! We will also be announcing the winner of our prize! Wow! I'm so honored to see my card in here. 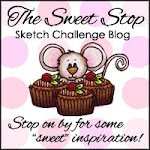 Thank you so much for fabulous sketch and for selecting my card to spotlight.